Let's get acquainted - our names are, Oleg and Julia. We are from Russia and have been living for several years in Cape Town. And all this time we do not cease to be surprised, how picturesque and generous the local nature is. Pine and eucalyptus forests interspersed with palm trees and olive groves, endless vineyards with impenetrable thickets of bush - all filled of clear mountain air and fresh breeze of the ocean under the scorching rays of the African sun. No wonder the tiniest in the world of it’s six brothers, covering the entire continent, the Cape Floral Kingdom - a kingdom of plants and flowers, is the most rich and varied. A true heaven on Earth - say naturalists and botanists, and all others who have visited these places, seem to agree. And the Cape Mountains creation, a gift to anyone who has not lost the relationship with the powerful breath of nature, is an amazing drink - Mountain Tea Rooibos. We tried Rooibos at the beginning of our trip to South Africa and Cape Town, and it quietly became indispensable for us. We drank Rooibos in South Africa, we have taken Rooibos to Russia, we suggest to try Rooibos to all who come here, believing that Rooibos - it's the best of what South Africa is famous for.In fact, what could be better than good health and a good mood on a long journey? And Rooibosplays an important role for its medicinal properties. But that we have learned much later, afterwe have become accustomed to a cup - another - a day, in a fresh, aromatic, slightly sweet tea from the foothills of Cape Town. It turns out that Rooibos contains no caffeine and tannin,unlike the usual tea and coffee, but contains a huge amount of antioxidants that prevent cancer development and aging, which puts it in an honourable first place among herbs. It has a whole bunch of useful properties - from the elimination of colic in infants and ending with the treatment of cataracts. And surprisingly, it didn’t turn out to be just tales of a PR manager, but was all backed by serious research, scientific facts proven in laboratories in Germany, Japan, the USA, Holland and South Africa for the past 25-30 years. On this subject, there are piles of papers in major medical journals. And the longer we lived in South Africa, the more information we uncovered and the evidence we have found about this wonderful plant from people who know. So our simple attachment to Rooibos fell on a powerful methodological scientific basis. Since then we evaluated Rooibos seriously. In the world Rooibos earned its well-deserved respect. From 12,000 - 14,000 tonnes of the annual gathering of the South African Rooibos 6,000 tons is exported, half of which immediately takes Germany, the remains go to Japan, UK, USA, Australia and other countries. It should be noted that the Rooibos grows only in the Cederberg Mountains, 250 km from Cape Town, and nowhere else. Of course, there have been attempts to cultivate it in Australia, South America - but it does not grow very fastidious, and the roots of it goes up to 10 meters deep into the rock. Therefore Rooibos is 100% organic produce, environmentally friendly and gets picked the old fashioned way - with sickles. Here in Cape Town, Rooibos - is the most popular beverage in addition to world famous South African Cape wines. Rooibos - is a matter of national pride of South Africa, just like the famous red wine Pinotage. Rooibos has taken its honourable place among the attractions of Cape Town such as Table Mountain, Cape of Good Hope, colony of penguins and other top sites of Cape Town coastline. Being in South Africa and not try Rooibos - is a big loss for a seeking and inquisitive person. 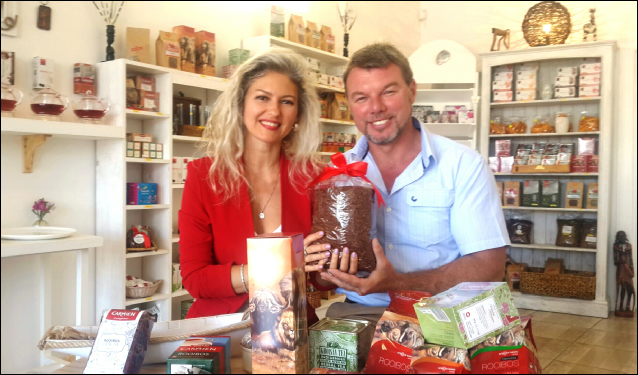 Given it some thought, we have come to a conclusion, why not open a cosy little shop selling rooibos somewhere in Cape Town in the pass-through tourist destination, to help tourists and travelers discover Rooibos! Our choice fell on Simon's Town, because of a huge number of tourists that visit the Cape of Good Hope and Penguin Colony, as their route lies through this quiet coastal town during the day. 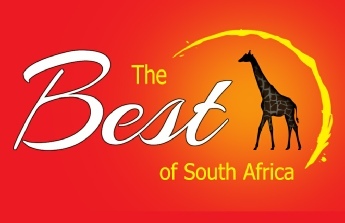 We’ve given a simple name to our tea shop - "The BEST of South Africa", as the Rooibos at the moment –is the best South Africa can offer to people caring about their health. The tea shop is located on the main street, in the very beginning of Simon's Town, between the historic hotel "Lord Nelson" and a popular among extremers- Diving Center. Apart from rooibos, we also offer South African biltong, dried meat - a real delicacy for those who understand. For tourists, it might be something new and interesting, and the ostrich and antelope meat seems most popular. The biltong, which we sell is "Halaal", which is very important for those of the Muslim culture in South Africa. And, of course, we sell a lot of local dried fruit, including mangoes, so loved by our compatriots from Russia. 1. A wide range of Rooibos tea and other goods based on rooibos from several of the best factories manufacturing - from the simple packaged to the gift sets, as they say - for every taste and colour. Starting from the presentation boxes and finishing with packages of 1 kg or more at available prices. At the same time Rooibos can be shipped to other countries by international customary postal tariffs. 2. For visitors we offer a free taste – and – tell about six kinds of Rooibos tea with the story of its beneficial properties, history and the main differences from other world similar beverages. The result is a fascinating mini-tour of Rooibos. 3. We try to save our customers time, so we do not organize many traditional tea ceremonies. Our Rooibos, because of its natural features, is always fresh and ready for use. The visitors themselves choose what they want to try and how much - everything is provided for self-service. 4. For residents of Simon's Town and regular customers there arefriendly discounts and bonuses available, while everyone will find something new and interesting! 5. We work seven days a week, because in tourism there is no such thing as a weekend! 6. Our shop is easily accessible, close to free parking which includes spaces for large tourist buses, which is important for the drivers and the tour guides going to Simon’s Town. 7. There are special offers for tour guides, because no one better than a good a tour guide will interest people in the local attractions with fascinating explanations! 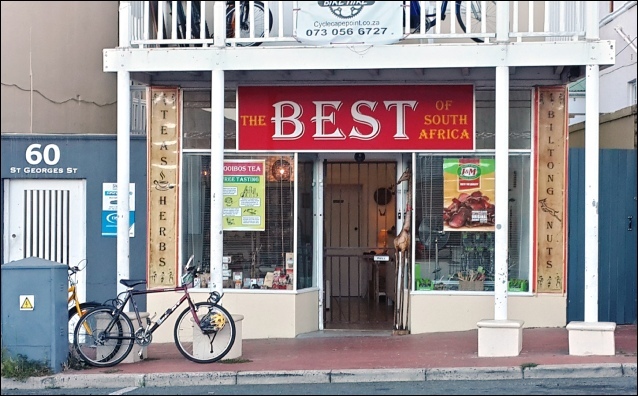 Welcome to "The BEST of South Africa" ​​- the best tea shop selling Rooibos in Cape Town! We look forward to see you making a pit stop at our shop, finding that something special and walking away with a purchase that has put a smile on your face!